In November of 2016, Olivia Vollmar was a freshman in college. Away from home for the first time, and suicidal, she struggled with fibromyalgia and panic attacks, drowning in coursework, and helping to take care of her father. It was was taking a toll on her physically and mentally. Twice that year, she contemplated suicide. Finally, she could tell someone. What her roommate didn’t know was that Olivia had been quietly studying CrossFit for two long years but was scared to try it. “Heck, I had talked to Dan Bailey on Instagram more than once. I figured if I went, I could at least tell him I finally tried it out and I could rearrange my plans to end my life another day,” she told us. “Did I really just agree to start going to CrossFit tomorrow?” she tweeted before she went to bed. 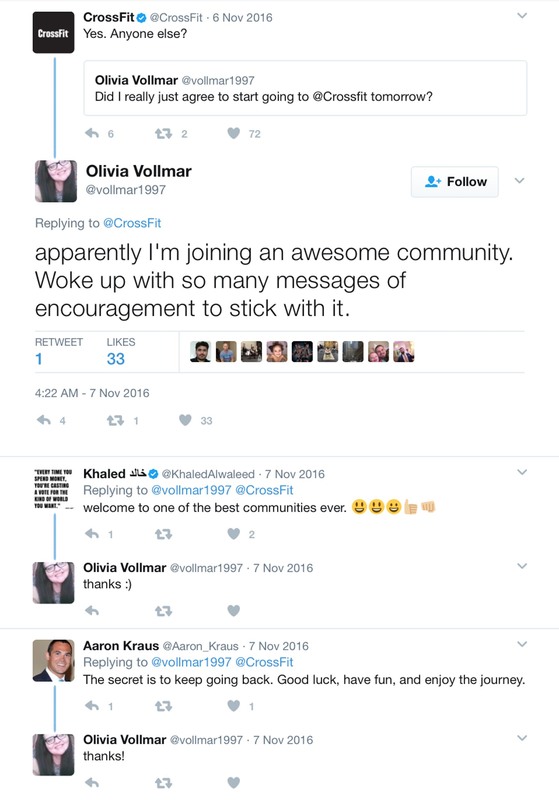 When she woke up, nervous to start CrossFit with her roommate, she discovered that all night long CrossFitters everywhere had been sending her encouraging tweets. She went to CrossFit and she loved every second of it. Two years later, she has completely changed her nutrition, completed her CrossFit Level One training, managed her fibromyalgia completely free of medication, and even got to meet Dan Bailey. But it’s not just for Dan Bailey. Olivia and her father changed their diet and started walking. Olivia changed the course of her life with CrossFit. Together, the two are down 270 pounds and healthier than ever. BREAKING NEWS – Kara Saunders is Pregnant!